Brian talks about the move from a rigid business to an adaptive one, why customer-facing brands are the most impacted by the social revolution. 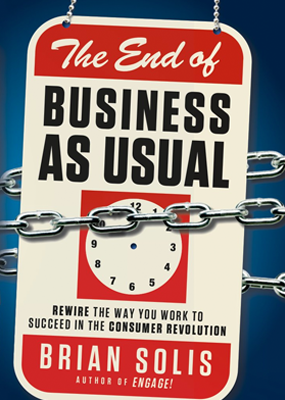 [The End of Business As Usual is] a book that explores a consumer revolution driven by a vast and efficient information network that begins to steer experiences, decisions and markets. Social business involves more training than most companies provide for employees, but this training will be worth it. At the very least, give everybody a copy of The Now Revolution, Public Parts, and The End of Business as Usual. All of these elements have challenged businesses to think differently. […] It’s not just about moving businesses toward Facebook, Google+ or Twitter; it’s about identifying the various groups of customers within the network, extracting intelligence, and reverse-engineering programs to activate desired responses and outcomes. Basically, start with the end in mind and work backward from there. The book serves as a recipe on how to fuel the engine of businesses by studying consumer behaviour and how the “ego-system” has panned out and become social media’s anchor to success. […] The easy-to-digest bits of the book are empirical truths on how people power works even inside the technology scene. The “digital culture” is redefining the way organizations respond to business needs, consumerism, work arenas and even at home. Simply put, the collective “What I want’s” could actually dictate the future of an enterprise. This complex consumer revolution that is changing the future of business, media, and culture. The book reveals how digital culture is changing the landscape of business, consumerism, the workplace, and what to do about it.